Randa Wagner | Morrow County Sentinel Jeffrey Miller addresses Judge Robert Hickson, Jr. at a bond hearing June 5 in Morrow County Common Pleas Court. The state was seeking to revoke Miller’s bond on a request from the surety to remove themselves from the case. Judge Hickson did not revoke the bond. 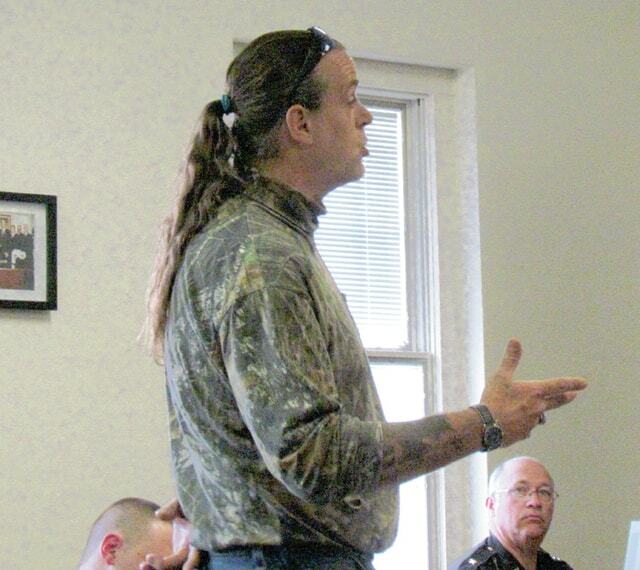 A motion by the Morrow County Prosecutor’s office to revoke bond in the case of Sovereign Citizen Jeffrey Miller, 51, was denied Friday by Judge Robert Hickson, Jr. The relative who sought to rescind the bond they posted May 4 on Miller’s behalf filed an affidavit with the court May 28, requesting to withdraw their support, concerned they may be found liable for the defendant’s actions in the future. Miller and two co-defendants are facing charges of burglary, attempted theft and criminal trespass after occupying a home and property on State Route 314 that they did not have permission to use or live in. The three were arrested at the site in late April and Miller was released from the Morrow County jail on $25,000.00 surety or 10% cash AND signature bond, which was signed by his relative. The relative now wants to withdraw their bond and wants Miller out of the residence off TR 108 she allowed him to stay in until his trial is over. After questioning the relative under oath, Judge Hickson felt there was not sufficient evidence given to validate concerns that Miller would violate terms of his bond, which he has complied with so far, according to the probation dept. Asst.Prosecutor David Homer felt a request from the relative to withdraw their support should be reason enough, since it was their money at risk. They have also attempted to evict Miller, with no success. Judge Hickson let the bond stand, though there is a no contact ruling between Miller and the relative and their spouse. He advised the relative to file charges through the prosecutor’s office if there are problems with harassment, threats or criminal activity. Homer also requested Judge Hickson issue an order to preclude unauthentic, disreputable and non-responsive legal documents from being filed in the case. In this motion, Homer maintained Attorney Don Wick aided the defendant in publishing ‘Sovereign Citizen nonsense writings in this action.’ The state seeks to restrict evidence to materials that are relevant to the case itself, and cease the barrage of materials defining the Sovereign Citizen movement and its platform. Hickson did rule that future materials submitted by the defense be limited to no more than five pages at one time and the material must be relevant to the case. A date of August 27, 2015 is set to hear all pre-trial motions. Miller’s co-defendants, Michael D. Plaster and Richard D. Sterling, will next appear in court on June 30, 2015.